Pulse granola in a food processor until it resembles a rough crumble. Transfer to a cake pan or pie plate and stir in bread crumbs. In a large bowl, combine melted butter, Tobasco, and salt. 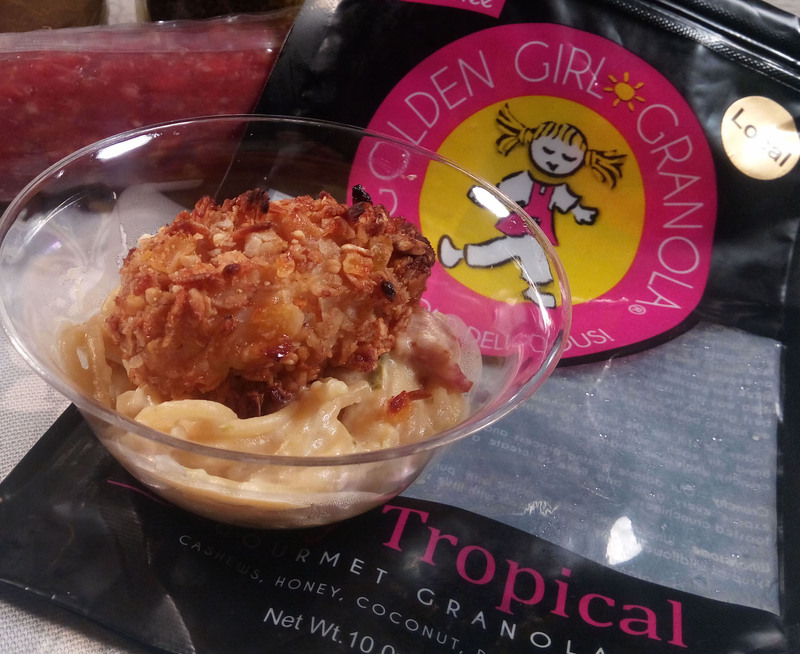 Dip mahi bites into melted butter mixture and then, dredge in granola mixture, pressing the granola onto all sides. Place on a parchment lined cookie sheet. Bake at 425 degrees for 7-10 minutes or until mahi is firm and opaque. Set aside while pasta finishes. Meanwhile, in a large skillet, fry bacon until crisp. Remove from heat and drain on a paper towel. Chop bacon and set aside. Saute onion, garlic, and jalapeño over medium heat in the bacon drippings until tender, approximately 5 minutes stirring constantly to prevent burning the garlic. As veggies soften, stir in cooked pasta. Toss pasta to completely coat with bacon fat and veggies. In small bowl, whisk together eggs, 1/2 c. Parmesan cheese, and 2 TBSP pasta water. Over low heat, pour egg mixture over pasta and toss with tongs to coat. Add remaining pasta water in small batches until the hot pasta and eggs form a sauce. Sprinkle with chopped bacon and remaining Parmesan cheese. If pasta begins to look too thick, add a little more water and toss pasta with tongs. Using small bowls or ramekins (for parties), twirl a tong full of pasta in each cup. Place one or two mahi bites on top. Serve warm.